MOSCOW (AFP) – Non-crew members were in the cockpit of the plane of Polish president Lech Kaczynski before its fatal crash in Russia, officials said Wednesday, raising fresh questions about the tragedy's cause. The aviation committee investigating the April 10 crash -- Poland's worst post-World War II disaster -- also revealed the jet's crew had ignored repeated warnings that weather conditions were not suitable for landing. (AFP file) A policeman walks past the wreckage of a Polish government Tupolev Tu-154 aircraft that crashed near Smolensk airport April 10. More than five weeks after the tragedy, however, the investigators still did not offer concrete conclusions about its cause. They said an act of terror, technical failure or an explosion have all been ruled out. "It has been established that in the cockpit there were individuals who were not members of the crew," said Tatyana Anodina, head of the inter-state air committee which investigates crashes in the former Soviet Union. Speaking after weeks of analysis of the plane's black boxes by international specialists, she did not comment on the identities of the individuals in the cockpit. Polish news agency PAP, quoting a source close to the investigation, said one of the voices was that of commander in chief of the Polish air force Andrzej Blasik. All 96 people on board including Kaczynski, his wife and scores of senior Polish officials were killed in the crash in heavy fog outside the western Russian city of Smolensk. There had been media speculation that a high-ranking member of the Polish delegation could have ordered the pilots to land, although until now this had so far been dismissed by investigators on both sides. 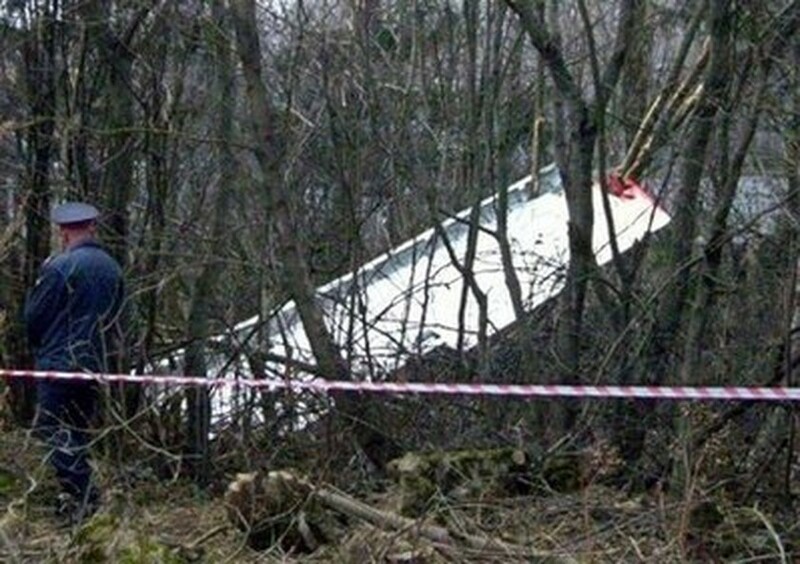 The Polish representative to the investigation committee, Edmund Klich, said the individuals had been in the cockpit 16 to 20 minutes before the crash. "I do not think this had a decisive effect on the causes of this event. But this is my personal opinion and only after a full investigation of all the circumstances will this be clear," he said, speaking through a Russian translation. Anodina said the issue required further examination and refused to draw any conclusions. The investigators confirmed officially for the first time that the crew of the Russian-made Tu-154 had ignored warnings from air traffic control not to land. "The air traffic controller at Smolensk Severny airport... twice warned the crew that there was fog at the airport, visibility was 400 metres (440 yards) and the conditions were not present to receive the plane," said Alexei Morozov, head of the committee's technical commission. He said that 16 minutes before the crash, the crew of the Tu-154 also received information from a crew of a Polish air force Yak-40 which landed successfully earlier in the day that visibility was 400 metres. Then, "four minutes before the crash, the crew of the Yak-40 informed the crew of the Tu-154 that they evaluated the visibility at 200 metres," Morozov said. Without shedding further light on the cause, Anodina said the technical commission had established that the crash was not the result of an act of terror or technical failure. "There was not an act of terror, an explosion, a fire on board or a failure of aviation equipment. The engines worked until the collision with the earth," she said. Kaczynski and the presidential delegation were killed as they were heading to a memorial service at Katyn, near Smolensk, for 22,000 Polish officers and troops killed by Soviet forces 70 years ago. The Katyn atrocity -- which Moscow for years falsely blamed on Nazi troops and was subsequently reluctant to discuss -- had poisoned relations between the two countries. But the crash saw a huge outpouring of grief in Russia and signs of a reconciliation between the two former Communist neighbours.